Zakat is Farz (Compulsory) on all muslims who is Maal e Nisaab and has Seven and a Half Tola (7 1/2) of Gold or Fifty Two and a Half Tola (52.5) of Silver. 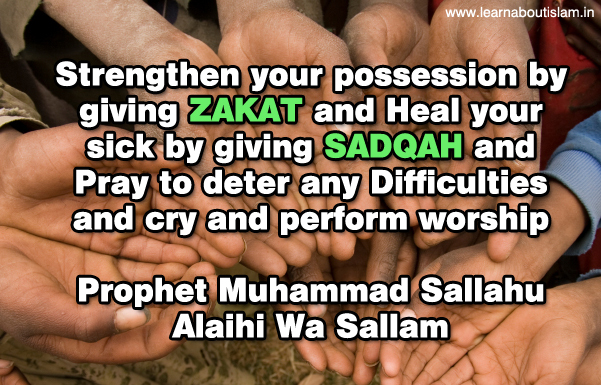 The one who rejects it is a Infidel (Kaafir) those who do not give Zakat are wrongdoers and worthy of punishment. According to Shariat, Zakat is defined as from your goods to take one part for Allah which has been fixed by Shariat and to make a Muslim poor person the owner of it. It is better when giving Zakat, Sadaqa etc. that it should be given to your own brothers and sisters, then to their children, then to your paternal uncles and aunts and then to their children, then to your maternal uncles and aunts and then to their children and then to people living in your home village or town [Johra, Alamgiri etc.]. It is quoted in the Hadith Sharif that Allah Ta'ala does not accept those people's Sadaqat whose relatives are in need of it and they give the money to others [Radd-ul-Mohtar]. Sadqah is wajib on a person who is maal-E-Nisaab and must give Sadqa-e-Fitr for himself and for his children, as long as the children are not the owner of Nisaab themselves and if they are then the Sadqa for them will have to be given from their goods. It is Wajib to give Sadqa of a mental child even when they reach adulthood upon the father as long as the child is not the owner of Nisaab themselves, and if they are the owner of Nisaab then the Sadqa will be given from their goods [Durr-e-Mukhtar, Radd-ul-Mohtar]. 2. The owner of Nisab in the ruling as regards Sadaqa-e-Fitr is such a person who has 7 ½ Tola gold (93 grammes 312 milligrammes,) or 52 ½ Tola silver (653 grammes 184 milligrammes), or their equivalent value in money or any other form of asset. Or, one owns business or non-business stock equivalent to that value, and these goods are additional to the basic necessities of living (Hajat-e-Asliyyah). 5. If one wants to give anything besides wheat, barley, dates or raisins; for example, rice, millet or any other linseed, then the price of 1 sa’ of wheat or ½ sa’ of barley should be taken into consideration. 6. In terms of weight, one Sa’ is four pounds, six and a half ounces (4lb 6.5 oz) and half a Sa’ is two pounds, three and a quarter ounces (2lb 3.25 oz). Thanks for the information.Muslims should know this very well. Muslim Entrepreneur business maintains these things purely. Start-up muslim is a leading platform who have experiences and help people in setting up this kinda business.